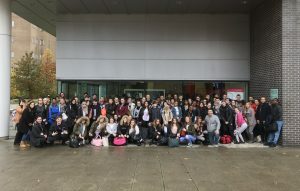 Just before half term, 110 x Year 11 pupils from Greenwood Academy experienced what their future university life could look like with a residential stay at Aston University. The two-day stay aimed to motivate pupils ahead their GCSEs, improve relationships with teachers and raise aspirations across the entire year group. Led by colleagues from UCB, and with collaborative support from Aston University, Newman University and the University of Birmingham, all pupils enjoyed workshops focussed on HE and progression, study skills and wellbeing as well as ‘The Big Brum Hunt’ across the city centre and a cinema trip too! Teachers were equally impressed as Cassie Portsmouth, Head of 6th Form, who attended the residential, commented ‘it was a really beneficial experience and there were lots of students speaking really maturely about their plans for the future’.